St John's wort (Hypericum perforatum). A yellow wild flower plant, the flowers are about one inch across, with black dots along their edge. Its medicinal properties have been long recognised for wounds and nervous illness. It flowers from June to September, and its Irish name 'Lus Eoin Bais' reflects when it first appears mid-Summer. Lus Eoin Baiste is the general Irish name given to the Hypericum family as they tend to flower during the month of June at the time of the feast of St. John. Hypericum perforatum is known as Lus na Maighdine Muire. Another Irish name is Lus Colaim Chille. St Columcille, according to his biographer Adamnan was said to have carried this plant in a package under his arm as a protection against his 'tussles with demons'. In olden days it was considered one of the most protective herbs for warding off evil influences such as fairy blight, witchcraft or the power of evil. For this reason, at midsummer it was hung up outside the home or worn on the body. There are many varieties of St. John's Wort and it is important to use Hypericum perforatum, recognisable by the tiny translucent dots on the leaves when held to the light. It is a delicate plant with bright yellow flowers, growing to a height of one to two feet. The flowers of this variety are star-shaped and only a quarter of the size found in parks and gardens. From midsummer to the beginning of September, St. John's Wort can be seen growing occasionally along the banks of the Royal Canal, in the Dublin Mountains and along the cliff path at Greystones. Otherwise it is mainly found in the Southeast of the country. It can be purchased in nurseries and cultivated in the garden. 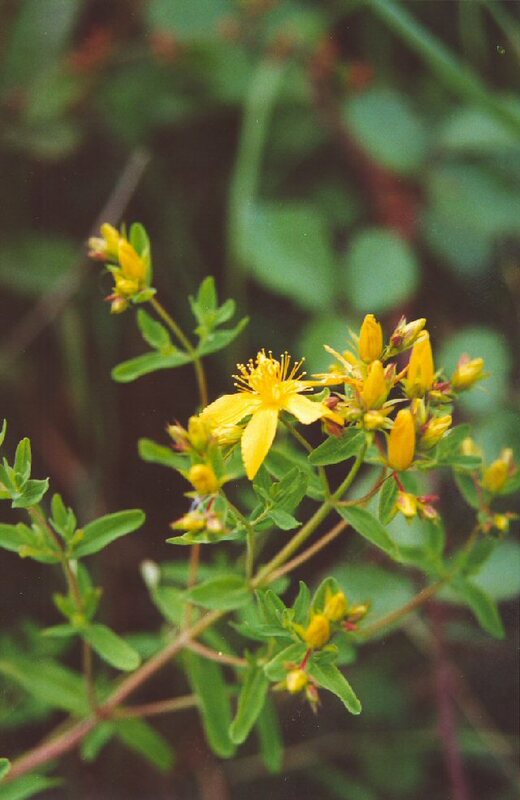 St. John's Wort had the reputation of healing illnesses brought on by the fairies such as "stitch, itch and cramp". In 1919, it was recommended by a notable herbalist in County Waterford to dispel the "clouds of melancholia" and also to drive away "fantastical spirits." There are 13th century records of a woman who was tormented by a demon. After much suffering another spirit appeared to her and told her to wear Ypericon (in Greek) and scatter it around the house. She considered this to be her sole defence against the demon but later found simple piety to be just as effective. Long ago, St. John's Wort was used to prevent bed-wetting in old people and children. Herbal infusions were given three times a day. This herb is also used for treating pain in sciatica and neuralgia. The flowers and herb are picked during the summer months traditionally the week following 24th June. They can then be dried at a medium temperature in the shade. An infusion can be made from adding the dried herb to boiling water. To obtain sufficient St. John's Wort for use over a year, five plants would need to be cultivated and harvested. Two years ago St. John's Wort was withdrawn from sale in Ireland without a prescription. According to the Medicines Board, this was due to adverse reactions if St. John's Wort is combined with other medical drugs.